Prepare answers to the questions below. Once your entry is submitted, there will be no opportunity to change or alter your input. Do not compose your answers while submitting. There is a login-timer running and you will be auto-logged off if your connection is detected as in-active for 10 minutes. Video/Streaming Data category for movie or streaming data clips up to 60 seconds in length, acquired directly with a microscope or generated as a streaming/video reconstruction from microscopy data. This section requests your contact information. This information will become part of the MSA database and will be used for official MSA business only. It will not be sold or distributed to third parties outside of the Society. By submitting to this competition you are agreeing to receive email messages related to this competition, future competitions, and other MSA events. You will be asked to fill in the following information with each image. Please download the COPYRIGHT Form here and fill it out. 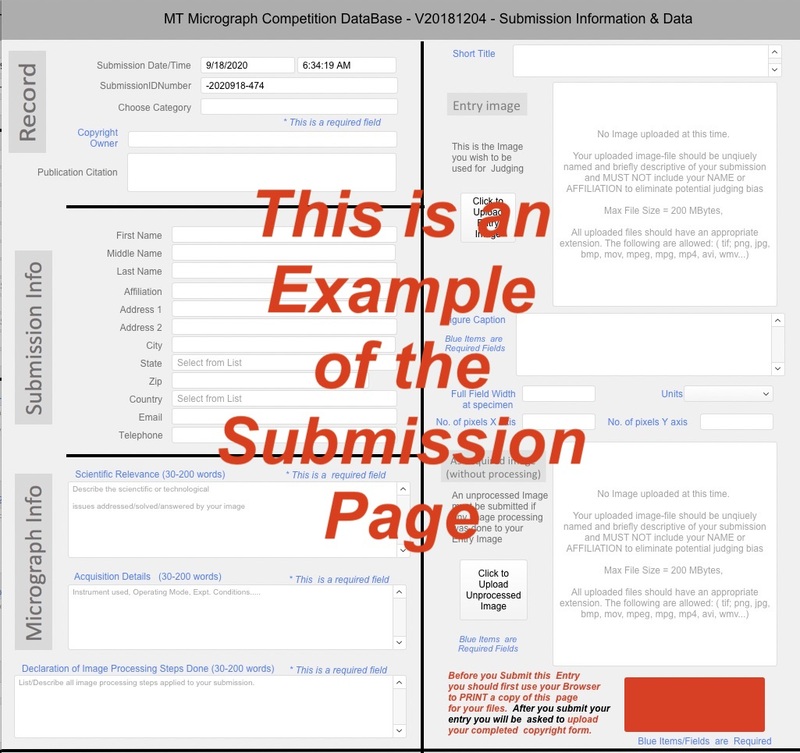 You must have this form completed for upload during your submission session. This form states that either that you took this image and own this image or that you took the image and have permission from the owner to submit this image to the competition. 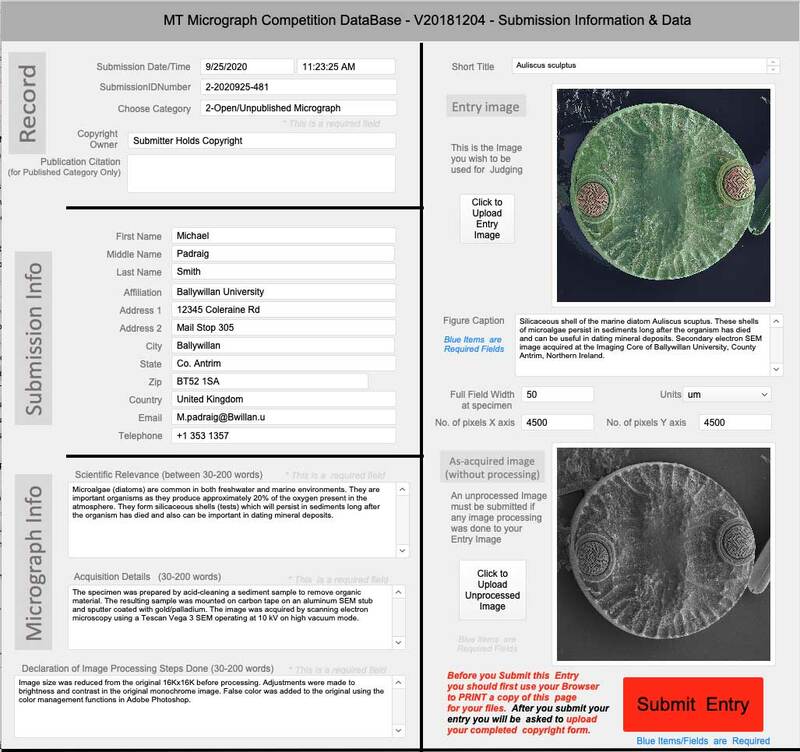 For the latter case, please have the copyright owner sign the form granting the Microscopy Society of America a non-exclusive license to use your image for the purpose of exhibiting and promoting this micrograph competition year on year. Please be ready to upload your signed form during your submission process. We cannot accept your entry without this form. Static/Still Images: should be submitted in one of the following formats: TIFF, JPG, PNG, BMP, at the original acquisition pixel density (e.g., 2048 x 2048 pixels) and bit-depth (up to 16 bit = 65,536 gray levels). If any image processing was performed on the image (e.g., contrast adjustment, cropping, kernel processing, etc. ), the raw unprocessed image also must be uploaded. Mind the deadline for submissions: Midnight Pacific Standard Time, February 21, 2019. To submit your entry click on the RED Button below.